DIMENSIONS: 6.1 x 6.2 x 3.1 in. OK, for those of you coming from smaller cameras, this one is big and heavy. It is built like a tank and could literally be used as a weapon against an assailant. It is sealed 10 ways from Sunday, and 1D series Canons have been known to be dunked completely in water and come out unscathed (don’t try this at home). Some people have been known to spray the mud off of them with a hose. I first started using this camera when I began taking sunrise pictures for The Day That. We needed to be there for the shot, rain or shine every day. So eventually, I simply began relying on the camera’s own sealing and dispensed with the rain cover. I even went out into driving rain storms with no cover to take shots. Of course, I needed to use a weather sealed lens. I have total and utter confidence in this camera’s weather sealing and construction quality. Now, what have I been shooting with it? Everything. Weddings, portraits, landscapes, concerts, sports, cityscapes, and most especially… wildlife and nature. You can see some of my shots on this blog and on 500px. After the sunrise job dissolved, I started concentrating on wildlife. I discovered my favorite bird is the Red-Tailed Hawk. And Eagles are also a joy to see and photograph. This camera can shoot like a machine gun 10 fps and it does a good job of maintaining focus at those speeds. This camera is ideal for shooting anything moving in low light. Concerts are a great example. It is dark, and the lights are always changing color and position on the band. And the band members are always moving. So, high frame rates at high ISO yield some great keepers that slower and noisier cameras would miss. Special mention goes to ISO performance. This camera is so good at high ISO, low light photography, that it literally extends my day. Animals tend to be active late in the day just before nightfall. Now, birds in flight photography requires around 1/1000 sec shutter speed (give or take). In low light, that means the ISO has to be cranked up. With my 50D, I’d be done at ISO 3200. With the 1D Mark IV, I don’t even bat an eye at ISO 12,800. And with a decent exposure, I can get a decently noise-recoverable shot at ISO 25,600. The versatility this gives in terms of lens choice, aperture choice, shutter speed, and how late or early you can shoot, is so comforting! Image quality has to be given center stage as well. With 16mp on a 1.3x crop sensor, it has a decent pixel density (equivalent to 26.5mp on a full frame sensor). So, I can crop into a shot and retain detail better than probably any full frame camera that has fewer than 26.5mp (assuming equal focal length and distance to subject). And the 1.3x crop sensor creates a field of view for my lenses that simulates 30% more reach than the same lenses would have on a full frame sensor. So, a 400mm lens appears to have the same reach as a 520mm lens would on a full frame sensor. So, less cropping is necessary. But, if cropping is necessary (which it always is with prime lenses) there are pixels to crop into. And there is just something about the images coming out of this camera. There’s a depth and accuracy that’s hard to put into words. Of course, lens choice is paramount. But, even with the same lenses, in difficult lighting situations, color and contrast accuracy is far better retained with this camera than with any other that I’ve used. I’m spoiled by this camera. Autofocus was given massive attention in this model. The previous model (1D Mark III) was accused of dropping frames in the AI Servo mode. So, Canon made sure this camera would focus. It locks and stays locked on the subject with tenacity heretofore unseen in cameras (except for maybe the recently-released 1D X, which has a 100,000 pixel metering sensor that aids tracking by sensing shape and color, but that’s another story). And to seal the deal, Canon provided multiple sensitivity adjustments and first subject/second subject priority settings. So, for example, if there are tree limbs all around, you can set the tracking sensitivity low, so it won’t try to grab the tree limb when the bird flies behind them. But, if there are no obstructions around, you can set the sensitivity high so it will acquire the bird quickly and allow you to change subjects quickly. Intangibles are abundant, but I’ll try to tangify them. This camera lets me get my whole-hand grip on it and it just feels right. The integrated battery grip is perfectly formed for both landscape and portrait shooting so you don’t have to contort your shutter finger over the top of the camera in portrait orientation. The sound of the shutter is just quality and precision. Other, lower cost camera shutters just sound cheap and clunk in comparison. The materials of everything in the camera are top grade, high performance and durable. And there’s just something special about knowing you have the right camera for any situation, rain or shine, sports or landscapes, wildlife or portraits. This camera not only does it all. It does it all with highest of standards. Anything else might fail you, but not this camera. Are there downsides? Yep. I can always list opportunities for improvement in my gadgets. In extremely low light, it sometimes has difficulty locking focus unless there’s a clear area of contrast for it to grab. The Autofocus points are rather big, so it may be difficult at times to pinpoint a spot to focus on if there are obstacles in the way or you are shooting through a fine-mesh fence. When holding the camera in portrait mode, it’s a far reach of the thumb to the multi-controller for when you want to change your default autofocus point. 1.3x crop, an advantage for wildlife shooting, is a disadvantage when you want more width from your lenses such as when you are shooting an event inside a building etc. Also, the potential for ISO performance improves with increased sensor size. This has been borne out by the new 5D Mark III and 1D X full frame cameras Canon released this year that have higher rated standard ISO levels (5D Mark III is 1 stop better, 1D X is 2 stops better). STILL CRAZY (ABOUT IT) AFTER ALL THESE YEARS? So, 2 ½ years after purchasing this camera, is there anything newer I’d prefer? As of now (July 2012), no. I like to shoot wildlife the most. So, the newer full frame cameras don’t give me the reach (with my prime lenses) or crop-ability I have with my 1D Mark IV. Now, if a new big-megapixel full frame pro body comes out with over 30mp, I will certainly give it a look, since it would provide even more detail for landscape shots, more crop-ability, and more width for event photography to complement my 1D Mark IV. I would like another body of the quality of my 1D Mark IV to put another lens on, so I don’t have to swap lenses in the field. But, this baby still rocks my world. This is a heavenly body! It should be for $5000. And it’s worth every penny. NEXUS: It’s the first Nexus tablet that Google has produced. Nexus devices contain a pure version of Android with no customized user interfaces. This means quick system updates, since less testing is necessary. JELLY BEAN: It’s the first device with Android 4.1 Jelly Bean. Jelly Bean builds on Ice Cream Sandwich with considerable performance and feature improvements. 7-INCH: The 7-inch diagonal screen size is becoming quite popular for its portability and decent screen size for things just too small to be practical on a phone. And it will fit in pockets and glove boxes (trust me). QUAD-CORE: The Nvidia Tegra 3, 1.2 ghz quad-core processor is a powerhouse. HD Screen: The 1280 x 800 pixel resolution, IPS, screen is very sharp and vibrant. On a 7-inch display, it has an impressive 216 pixels per inch (ppi). CONSTRUCTION: Google designed, and Asus manufactured this to premium quality standards. Corning Glass display and a grippy back don’t disappoint. PRICE: $199 (8gb), $249 (16gb). Premium quality at a Kindle Fire price. Nice. If you take the quality of a premium tablet and give it the advantages of a purposed tablet like the Kindle Fire, but without limitations on where to shop or what to buy, and price it really low, you get the Nexus 7. This is the closest thing to a no-compromise tablet that I’ve seen. Compared to the Kindle Fire, it is better made (thinner and lighter, faster, quad-core processor, higher resolution IPS display) and adds a front facing camera for video chat or hangouts. It has a grippy, almost rubberized-feeling back that is most appreciated after handling slippery tablets. Performance? It is killer fast. Browsing with the default Chrome browser pulls web pages up in a blink. You can also thank the 1.2 ghz tegra 3 quad-core processor in concert with the silky smooth Android Jelly Bean operating system. Google says it is designed for the Google Play Store, and they give you a default home screen that is the Play Store. So, you can go right into buying apps, movies, books, magazines, etc. if you want. Or, you can go to anyone’s site and do what you want. Play is there as a convenience, not a constraint. And Google throws in some magazines, a book, and a game, and a $25 store credit. Nice. Jelly Bean deserves special mention here. Although Google just makes it a point release (4.1 vs 4.0 Ice Cream Sandwich), it is a massive update. Google put a team together to wage war on lagginess. They called it “Project Butter.” They took a close look at what caused lag in previous versions and instituted better buffering, timing, and predictive measures to smooth out the screen motions while maintaining (and even boosting) Android’s speed. They really nailed the performance aspect. But, Jelly Bean also adds some really awesome features that improve the user experience. One new feature is called “Google Now.” You swipe up to activate it and it will note your location and time and take into account all of your habits, preferences, likes, dislikes, etc. and anticipate the information you want to see even before you ask for it. Info like the weather at your location. Telling you if there’s a traffic jam on your normal route to work, and suggesting an alternate route. Noticing you are near a restaurant that serves your favorite dish and telling you about it. Telling you when you have an appointment and taking into account how long it will take to get there and which is the best route to take. Just a really cool feature. Also, Google puts Voice Search in Jelly Bean where there’s a Siri-like voice that answers your questions. You ask questions in a conversational way, and it answers you quickly, accurately and in a voice that actually sounds human. There’s an Enhanced Notification Panel that, after you pull down the notification list, you can expand some of the notifications (if they’re expandable) to see more text. These notifications are now actionable as well, so you can “like” a Facebook post or share a picture, etc. right there in the notification panel without having to first launch the application. So cool! All notifications can be swiped away with a flick of the finger one by one, or all at once with a single tap on a button at the top of the list. As mentioned previously, the default browser in Jelly Bean is Chrome. It is really fast and always displays the address bar at the top along with a refresh button. One really useful feature of Chrome is that, when the text is small on the screen, and you tap close to two adjacent links, Chrome instantly zooms the two links large, so you can easily tap the one you want. Oh so cool! One really nauseating thing about Chrome is that it is the first default Android browser that is not compatible with flash. I know my IOS friends differ with me on this, but my firm attitude is that any web content viewable on the desktop should be view-able on mobile devices. And right now, there is content I want to see, but I can’t with mobile Chrome because the content is flash-only. But, Adobe will not support flash on new browsers, operating systems or chipsets. Upside is that some sites that have flash-only content provide apps that let you view the content on non-flash browsers. An example of this is the recently-released “The Verge” app. I love that “90 seconds on The Verge” daily video. The Nexus 7 is thin and light and grippy, so it is comfortable to hold in one hand while swiping with the other for hours while reading or browsing. Try that with a 10-inch Tab or iPad and your arm will get sore. Also, the 7-inch size is ideal for taking to club meetings and taking notes. It’s also far easier to take to a restaurant and lay on the table without taking up the whole area like the larger tablets do. It will fit into a jacket pocket or, for the ladies, in a hand bag pretty easily. It even fits in my shorts pocket and my car’s glove box. 8gb and 16gb versions with no micro-sd storage expansion. No vibrating source for keyboard haptic feedback. No rear-facing camera, just a front one, and no default camera app. Now, it appears Google was surprised that the $199 (8gb) version wasn’t the hot seller of the two. The $249 (16gb) version has literally sold out nearly everywhere, and Google has had to stop selling it on the Play Store until manufacturing catches up with demand. Those who thought there was a race to the bottom in price, think again. With no expandable storage, the 16gb version is wildly popular (double the memory for just $50 more). Although there is no haptic feedback (vibration), notifications still are heard audibly, and notification symbols are displayed in the usual places. It doesn’t break my heart that there is no rear camera. Frankly, I think it looks silly to hold up a tablet to take a picture, especially if you have a perfectly fine camera phone (or even a genuine camera). Wi-Fi only has ups and downs. The ups are that it’s cheaper, uses less battery, thinner and lighter, no service contracts, and no waiting on Carriers to test system updates before they push out. The down-side is that I need to enable my mobile Wi-Fi hotspot on my phone to serve a Wi-Fi signal to the Nexus 7 if I’m somewhere that doesn’t have Wi-Fi. And one more thing… As if to mask the hoopla surrounding this exciting new product, a chorus of rumors of future competitors to the Nexus 7 is filling the blogosphere. But whatever else the future products are, they’re not here. The Nexus 7 is right here. Right now… And it rocks. I have a few of my favorite pictures on 500px. Some of them are ready to buy a print or digital download. Check it out: http://500px.com/stevenhoagland. Do I have a gear beat topic for you! OK, this is what I’ve dreamed of for years! So many times I’ve gone looking for wildlife. It gets dark. Wildlife comes out. Lens is either too short, max aperture is too small, or it has no IS (image stabilization). Either the wildlife gets away, or noisy and cropped images proliferate to frustrate me. The dream was to have a lens that was long, fast, sharp and with state-of-the-art IS. This is it; the Canon EF 400mm f/2.8L IS II. Simply put, it is the sharpest lens Canon has ever made. Also, this lens extends my day, literally! I can shoot earlier in the morning and later in the evening since f/2.8 and hybrid IS combine to allow more light in and damp out any motion I may have hand-holding the lens at lower shutter speeds in near darkness. Yes, even hand-held. At 8.5 lbs, it is a whopping 3.3 lbs lighter than its predecessor. And the center of gravity is now closer to your body, since much of the weight savings was taken from the front of the lens where the previous model had a large glass element (not a lens element) for added protection. As often as not, I go slingin’ (hand-carrying) with this lens on my Black Rapid strap. It is a bit heavy, but manageable. It takes the new Mark III versions of the extenders well, too. I got the 1.4x III and 2.0x III extenders when I bought the lens. So, it’s like three lenses in one (400 f/2.8, 560 f/4, and 800 f/5.6). The new Mark III extenders include a processor that aids autofocusing accuracy when used with the new Mark II supertelephoto lenses (300 f/2.8 II, 400 f/2.8 II, 500 f/4 II and 600 f/4 II). Last year, I thought I wanted a 600 f/4 II. But over time, I realized there were situations where I wanted to get closer, or the animals were bigger or I really needed f/2.8 in low light. So, the 400 f/2.8 II was the choice. I’m so loving it! More nature and less frustration. I can’t wait to get back to Cades Cove and have another shot at those bears! A surprise bonus is that it is fantastic with any photography (not just sports and wildlife). The transmittance of image contrast through this lens is as close to perfect as any lens Canon has ever made. If I can fit the subject into my frame, I choose this lens over any other, even indoors! It really spoils me. Dream the impossible… and breathe it to life. Don’t follow in the footsteps of greatness… make your own. And grin at that hero in the mirror. Face Unlock — Unlocks your screen by face recognition. Swipe unlock directly to camera. Talk to type — words appear as you “type” with your voice. Android Beam — Using ICS and NFC share any content between Android devices by bump and tap. Screen shots — Hold down power button and volume down to get screen shot. Keyboard in-line spell checker with suggested corrections. Release date? November 10 (est.). Price? $299 on contract (est. w/32GB). Ice Cream Sandwich looks delicious! The famous WebOS developer, Matias Duarte, is now at Google and he has proceeded to make Android 4.0 Ice Cream Sandwich an emotionally pleasing experience, from the new system font (Roboto) to the finely polished and well color-coordinated screens, buttons and tabs, to the convenience features that make life simple. Ice Cream Sandwich combines the separate phone and tablet OS’s into one operating system. It is designed to work terrifically with HD resolutions on both tablets and phones. Note: If you are a Samsung Galaxy Tab 10.1 owner, you’re in luck. You will be getting Ice Cream Sandwich! One thing should be pointed out about the Samsung Galaxy Nexus display. Blacks are true black. So contrast is superior, and the screen just POPS! Nothing else comes close. And it’s more energy efficient, since the black pixels don’t fire. Although the 4.65-inch screen is big, the overall phone isn’t as big as you’d think, since the nav buttons (back, home, etc.) are integrated into the screen, so they’re always oriented correctly. The bezel around the screen is thin, too. The phone is said to be nicely pocketable. I believe it. And this handset is subtly curved for comfort in your hand and against your face. Verizon – broader signal coverage and blazingly-fast 4G LTE connection speeds. Samsung’s Super AMOLED HD display – It just POPS. Nexus – Google Nexus phones get the latest system updates quicker than all the other phones. Galaxy Nexus has it all! I’ll follow up with a review when I get it. That’s right, “WHEN” I get it! Happy birthday, me! Oh Baby! 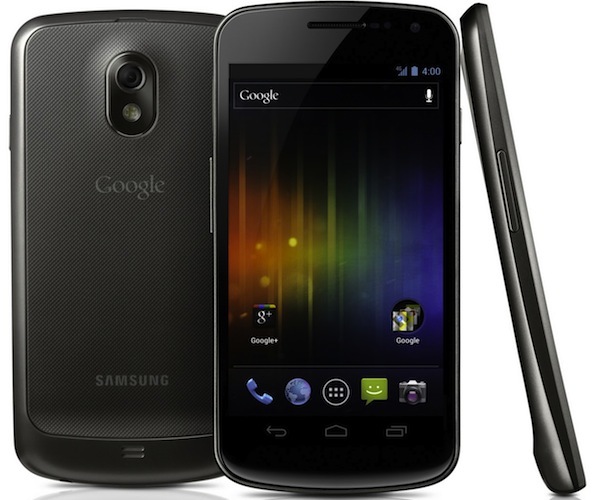 One thing’s for sure.. Galaxy Nexus, you will be mine! 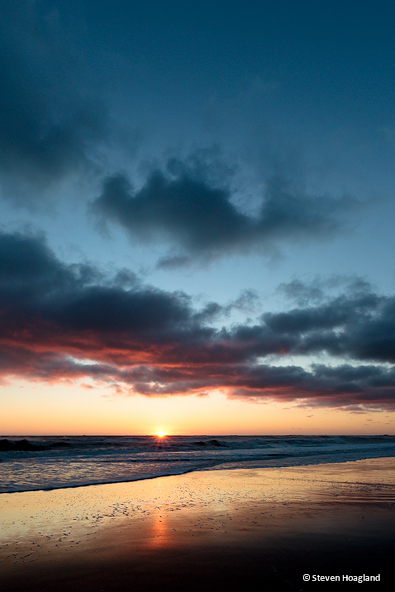 At the dawn of my sunrise photo experience, I was presented a morning of unimaginable inspiration. Thousands of sunrise photos later, this one is still my favorite. I thought I’d share this trip down memory lane with you. A dusting of snow covered both sides of the road as I drove to Virginia Beach on this morning. It was 28 degrees and some areas were slippery. The road next to the beach was crunchy underfoot—ice. As I proceeded down the snow-covered walkway toward the beach, I saw an orange glow spanning the whole width of the horizon. Up in the pre-dawn sky, I saw a few dark clouds floating on a sea of soft blue; up to my right, a crescent moon. Although I couldn’t reach out and touch this horizon, it touched me. I felt privileged to be presented this beautiful moment, and humbled by the challenge to capture it forever. Although no one else was around to see, I walked off the beach smiling, assured that there is a God. Steve Jobs was just a man. Like each one of us. He rose above mediocrity through shear force of will. He taught us to never settle. Shall we have the will? Not just for your accomplishments. But, for your inspiration to us all. Rest in peace, “young and foolish” man. Since I’m obsessed with mobile devices, I’ve been thinking about adding a “Mobile Beat” category to this blog. Sherry Boylan (of ChesBay360 fame), suggested I do a “choosing tablets” blog. Great first mobile beat topic. Then, I discovered iPad’s operating system (IOS) didn’t do things like flash (80% of what moves in the Internet), notification panels, over-the-air operating system updates and voice recognition text entry like I’m used to on my Android phone. The Google Android ecosystem nicely integrates contacts, gmail, google calendar, google maps, gps navigation (yes, voice activated with turn by turn audible instructions), etc. I’m spoiled by Android goodness. So, my tablet search then tread in Android waters. Enter the Samsung Galaxy Tab 10.1. 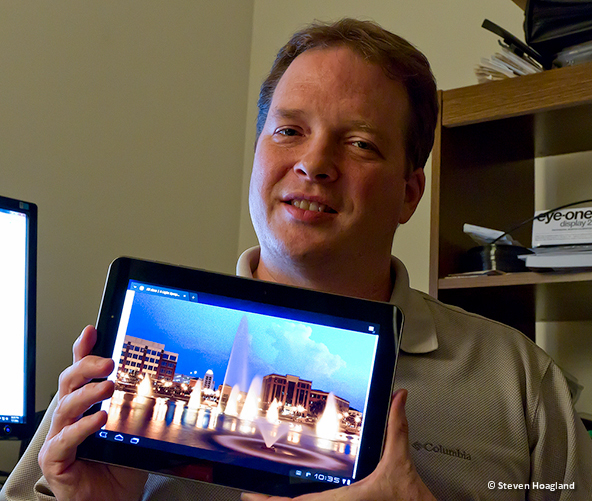 Why I chose the Tab 10.1 instead of the iPad2? Android, Wide Screen Aspect Ratio, Higher Resolution Screen (1280 x 800 vs iPad’s 1024 x 768), More vivid display, Higher resolution cameras (front and back), Higher resolution video recording, Slightly thinner and lighter, Stereo support (left and right speakers vs iPad’s single speaker), Customizable home screens, Superior browsing experience. Now don’t get me wrong. The iPad is a wonderful device. And if you are already in the Apple IOS ecosystem with an iPhone or iPod Touch, then you may be more at home with an iPad. I’m loving that Android system updates come over the air. Already an update from Android Honeycomb (Android’s tablet operating system) 3.0 to 3.1 has been pushed out. Soon, Android 4.0 Ice Cream Sandwich (combining phone and tablet operating systems) will push down. So far, iPads still have to connect to the computer for this. I also like to voice in my text entry on occasion. Just tap the microphone key and speak. Sometimes I have to edit a character or two, but it does save typing. Use cases? Internet browsing, Facebook, Google+, 500px, Twitter, HRDPC club meetup site, pictures, video, e-mail, reading books and magazines, music via Amazon mp3. I take it with me to restaurants, club meetings and anywhere I may have to wait. Apps? I love the Android Kindle app. I prefer to read kindle books downloaded to my Tab. They’re in color! Great for photography books. Also, I love the Zinio app, my preferred way to subscribe to and read magazines. The Android Netflix app lets me watch movies on the Tab. Oh my gosh!!! Movies are awesome on this Tab (brilliant screen, wide-screen aspect ratio, stereo speakers). The more squarish aspect ratio of the iPad leaves large letter-box lines at the top and bottom of the screen when viewing movies. The iPad’s single speaker? Uh uh. The cloud synchronizes songs from Amazon mp3 on my PC, phone and tablet. And the cloud synchronizes the book pages between all these devices. I got the Wi-Fi Only version of the Galaxy Tab 10.1. This requires you to be somewhere where there’s a wi-fi signal (home, restaurant, etc.). In places that don’t have free wi-fi, I just tap the wi-fi hotspot box (tethering) in the settings of my Android phone, and I’ve got wi-fi for my tablet–provided there’s a data signal (e.g., 3g, etc.) in that area. The wi-fi version frees you from having to sign onto a data plan with a carrier. Caution, some carriers charge extra for tethering. Negatives? Occasionally, the browser would close and put me at the home screen. This has almost been alleviated with the Android 3.1 update. Also, on one occasion, the back/delete button didn’t work. Note that the Android 4.0 operating system (code name Ice Cream Sandwich :-)) is due out soon, and may resolve these issues. Also, I wish the Tab had a MicroSD card slot (also an iPad failing). The max memory you can have is 32GB and it’s not upgradeable. The iPad can have up to 64GB. Not sure if I’ll ever use 32GB, though. **UPDATE** I must add that, although I have the apps I like, the number of tablet-optimized apps available for the long-established iPad dwarfs those of the much younger Android tablets so far. If the apps follow suit with the smartphone world, this gap will close at a blistering rate. And the key is not the number of apps, but are the apps you really want available? Price? $499 wi-fi w/16 GB, $599 wi-fi w/32 GB, $529 wi-fi+4G w/16 GB, $629 wi-fi+4G w/32 GB. Note that some Android devices are 4G capable in areas that broadcast 4G signals. IOS devices (iPhones, etc.) are not. So now, when I’m on the go and want to see it on a big screen, I put it on my Tab! My friend, Sherry Boylan of ChesBay360.com, had a terrific idea for me to post gear reviews. So, I created a new category–Gear Beat. Sherry’s been known to say, “I’m not feelin’ the pod” when she’d rather hand-hold the camera. It fits here for my first beat. Travel to new places and don’t want to lug a heavy tripod around? I got a tip (thanks, Sherry) on the availability of a super new travel tripod from Oben… the CT-3510. 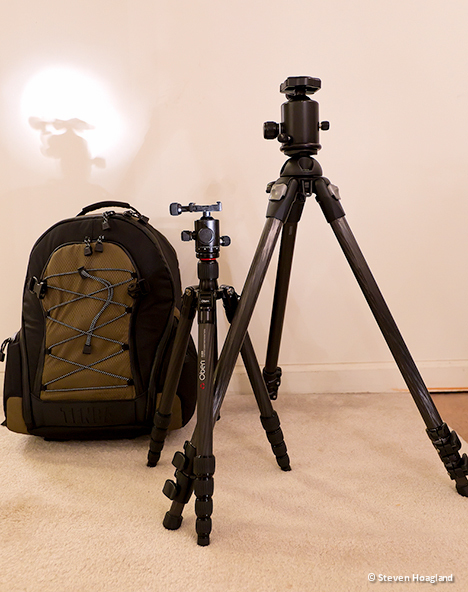 Research showed that this carbon fiber tripod matched the features and capacities of the Gitzo Traveler GT-1541T. On my recent trip to New York City, I sauntered into B&H Photo (yeah, the actual store!) and checked out the most popular travel pods thoroughly. Honestly, I couldn’t find a more desirable travel pod than the Oben—at any price. It’s extremely light (3.2 lb with ball head attached), compact (15.5” folded up with ball head attached), and nearly 17 lb load capacity. Further, it is just beautiful. All the twist locks and knobs on the legs and ball head are rubberized for a nice grippy feel and tactile feedback that lends confidence that it’s locked down firmly. It also has nice touches like foot spikes you can install, and a removable leg that can be attached to the removable center post for a really cool monopod. I checked out the height with the legs fully extended and the center post down. It’s actually pretty tall for a travel pod. My back is thankful. It only takes a quarter-turn to unlock and lock the twist locks. And the legs can individually lock in two different angles, which helps in sloped or rocky terrain. Negatives? The internal joint components aren’t as high quality as the Gitzos, and parts may not be as easily replaced as those in Gitzos. For heavy duty work using a super-telephoto lens, I’d probably go with the Gitzo GT3541LS and a Wimberley gimbal head, but that’s a different use case. The Oben’s price…$399.95 including ball head. That’s a cool $600 cheaper than the Gitzo (w/head) combo. I liked the Oben best, and I’m not gonna hold it against them if they want to sell it cheaper. Heck, I thought, why not give them a chance? So far, I’m thrilled. Not a single complaint. We’ll see how it holds up over time and travels, though. Note that my September 19, 2011 pic “Bright spot in dark times…” was taken at Clingmans Dome with my camera atop the Oben. Now, when I leave the hotel or cabin, I’m feelin’ the pod. Check out the links below for more info.